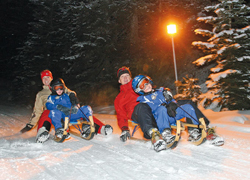 Winter in Ramsau am Dachstein caters for a diverse range of winter activities, recreational or sport. The following page gives a taste of some of the activities you will find in this region, for more information follow the various links. Haus Maria is conveniently situated for the ski bus (bus stop 50 metres), which covers Ramsau am Dachstein and the Glacier. It is also possible to go down to Schladming and the Planai from here (6km). Ski Passes can be purchased for the Ramsau Am Dachstein Ski Area, including the Dachstein Glacier or for a little more and much better value, a Ski Amade Pass that entitles you to use the whole Ski Amade Region. Many Ski Buses are included. The Haus Maria Mini Bus is also available for Ski Shuttles to various lift systems in the area including the Enns Valley. A small charge applies depending on the destination (Maximum €4,- per person return) The Mini Bus may not be available in the event of Airport Shuttles commitments. 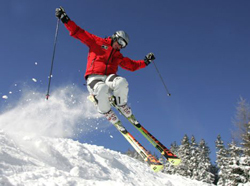 We can arrange your lift passes, lessons and equipment hire. We use http://www.pitzer.at who we think are the best value in Ramsau. Please ask for details in advance to ensure you get what you want and have more time on the slopes. The SKI AMADÉ covers 28 skiing regions, 270 lifts and 860 km of piste. A SKI AMADÉ lift pass covers all 28 skiing regions including Ramsau. 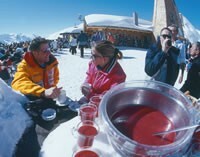 All levels of Skiing are catered for in the Ramsau and Ski Amade region. 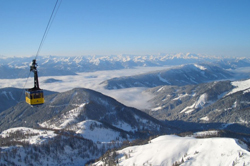 There are many Ski Schools in Ramsau and the surrounding area catering for all levels. Ramsau has a number of Nursery slopes. There is a T-Bar lift just across from Haus Maria where beginners can practice their moves. Ramsau is the Langlauf destination in The Alps regularly hosting FIS and other Nordic Skiing Events through out the season. In the autumn you can see cross-country skiers of many nationalities training on the Ramsau plateau in readiness for the winter season, which starts in December. There are 150km of trails from easy to demanding and 70km of skating trails at altitudes of 1100m on the Ramsau plateau up to 2700m on the Dachstein Glacier. Ramsau has a major Langlauf Training Facility and various Langlauf Ski Schools to cater for everyone’s abilities. Snow Boarders are well catered for in the Ski Amade area. 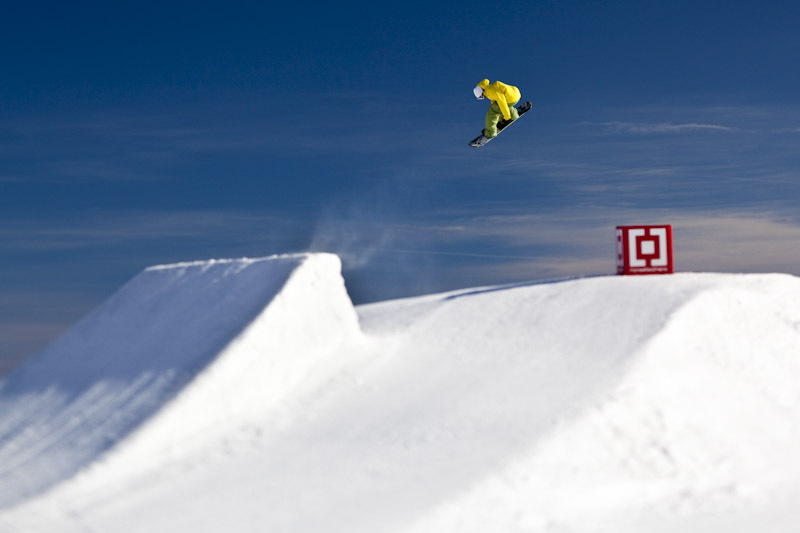 Locally there is the ￼￼Hochwurzen Playground, SNOW PARK PLANAI, amongst other areas to satisfy your needs. In particular the ￼Atomic Superpark on The Dachstein is one of the best Snow Board areas you will find with all the obstacles you need to perfect those techniques. Check out the web sites. For the more adventurous there is the 7km track on Hochwurtzen in Schladming. 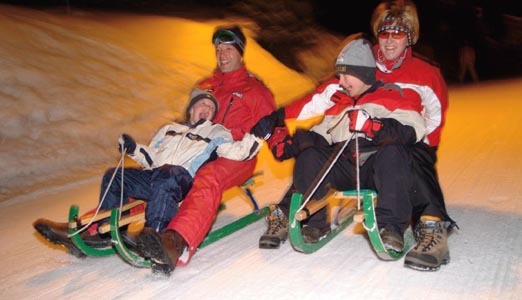 Toboggan down the Floodlit Rittisberg coaster or on more traditional Toboggans and enjoy a pleasant meal at the mountain restaurant. The Dachstein crossing takes between 4 and 5 hours incl. refreshment stop. Ski touring is becoming more popular and great way of getting away from the hustle and bustle of the piste and you get to enjoy all that scenery. With a local guide you set off from the mountain station of the Dachstein cable car at 2,700m, the tour leads over the wide Dachstein plateau to Obertraun and Hallstattersee. A distance of 25 km is covered, mostly in the form of descents, over the unspoilt natural heritage region. 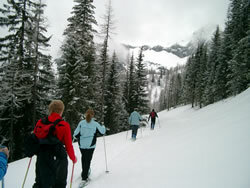 In Ramsau you will find 70 km’s of footpaths prepared for walking, snowshoe walking and horse-drawn sleighs. 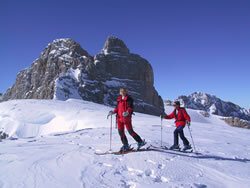 A number of companies in Ramsau offer Guided Snow Shoe walks including a Tour across the Dachstein Glacier. 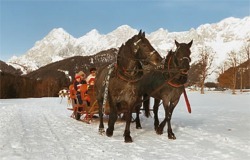 Why not treat your loved one to a romantic evening sleigh ride. A typical classical route through the winter countryside leads around the Kulmberg. As well as the Sky Walk observation deck there is now a new highlight at the Dachstein. 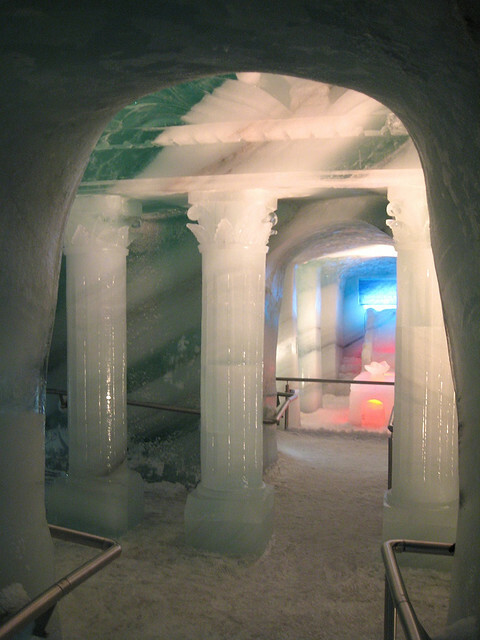 The Dachstein Ice Palace offers visitors the opportunity to explore the hidden worlds found in a glacier. The Ice Palace is only a three-minute walk from the Dachstein mountain station. It opens up an entirely new world of ice and is open all year round. 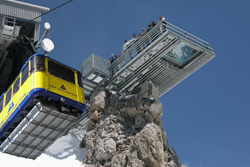 Take the cable car from Türlwand up to the Dachstein Glacier and experience a view of the top of the world from the Dachstein Sky Walk at an altitude of 2700m above sea level. Here you will be greeted with views of Slovenia in the south and in the north the Czech Republic. 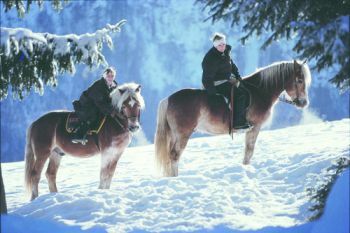 Ramsau has a number of Riding Stables offering winter rides through the snowy landscapes and forest trails. Moonlit Rides are also possible subject to weather conditions. There are plenty of huts, bars and hotels in Ramsau where you can go for lunch and on a good day top up the tan at the same time. Costs locally are pretty reasonable. Some of the ski schools offer to take you for lunch included in the lessons. Fatbikes are special mountain bikes, built specifically for use on snow. The extremely wide balloon tires allow ease of movement and ease of handling in all snow conditions. Through their safe handling Fatbikes are also suitable for children (ages 12 and up). Ramsau am Dachstein, with its many constantly groomed winter hiking trails, carriage roads and cleared forest roads provide ideal conditions in winter to have fun on these bikes. Fatbike on Snow has 10 brand new Norco Fatbikes including the necessary equipment for your winter adventure on 2 wheels. Every day there are several guided tours with different degrees of difficulty.